I see the stories about families giving goats as gifts, or tweens using their birthday money to shop for toys to donate to the needy and my heart just melts! I hope that my own children will one day develop this sense of community and the joy that comes with giving. Like many parents, my moral thermometer struggles with the notion that we’re creating consuming-critters instead of charitable-children, but even so, I’m still not ready make the full leap from giving our children toys for Christmas to donating Tetanus shots on their behalf. I’m hoping that by incorporating charitable giving into our family Christmas traditions, though, our children will one day choose to give back to the global community on their own accord. We’ve had the opportunity to donate dry goods to the food bank at three different events so far this holiday season and have had many conversations about the fact that some people celebrate the holidays differently and that all families have different budgets. Our mantra “different families, different rules” seems to satisfy their Santa questions, for now! I did all of my gift shopping online this year (for the first time … it rocked!) and the kids will be playing with Lego and Monster High dolls on Christmas morning. But in our attempt to foster a sense of community and charity, we chose Unicef Survival Gifts for their teachers and I have no doubt that their teachers will make a big deal of thanking them for donating on their behalf – furthering our quest. 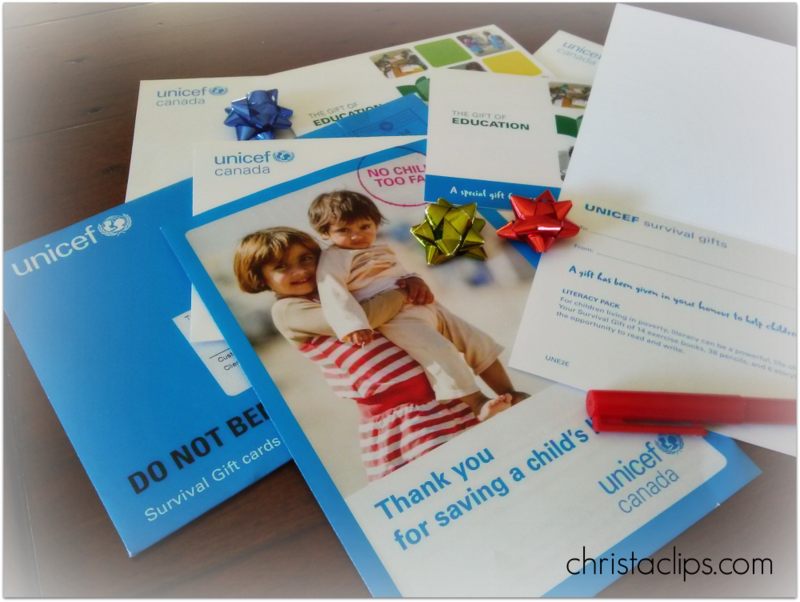 The gift cards from Unicef arrived in the mail today and outline exactly what was included in the online gift with lots of space for the kids to doodle and write their own message. Music to my ears. Maybe we’ll be that goat family, one day! Wordless Wednesday: 10 More (short) Days! 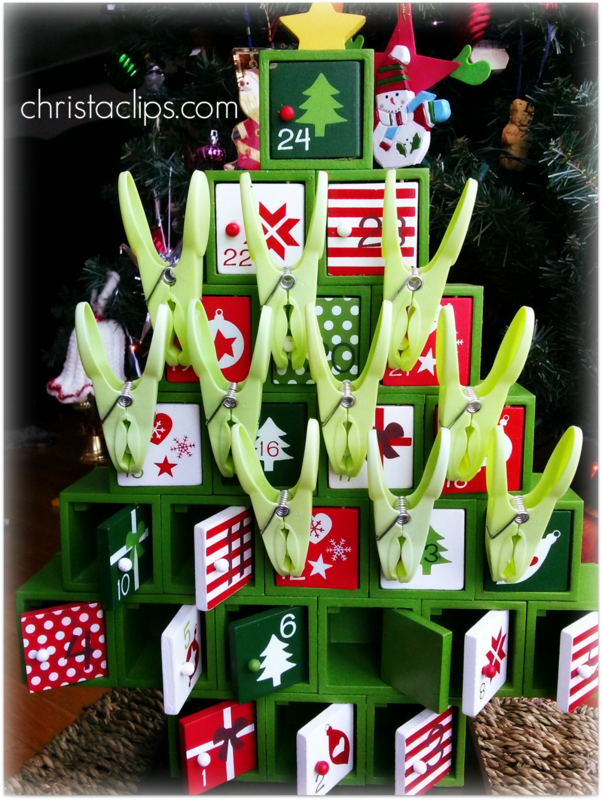 Christa Clips’ advent calendar stops on the 21st! Our kids love finding a trinket or treat behind the little doors in our Advent Calendar as they countdown to Christmas! I have my own countdown this year and have my eyes on door #22 which marks the Winter Solstice! The sun dipped behind the neighbour’s roof at 3:15 yesterday afternoon and that’s simply not enough sunlight/heat for my drying racks in front of the patio door! If we can make it to the shortest day of the year on December 21st without a dryer, I say we’ve passed the “dryer-free living” test! All Aboard the Savings Train! Christa Clips: Save-at-Home-Mom started out on a savings train this week by spending $18 on specially marked boxes of Mini Wheats and has already redeemed $14 worth of coupons and will save on her groceries for months to come! This past week I found an amazing deal in a grocery store, the good old fashioned way; no apps, printed coupons, or digital flyers. I’d been out late (rare!) and stopped into a 24 hour Sobey’s on the way home. There really wasn’t anything in the flyer that stood out as big savings, but I always enjoy visiting out-of-town stores for new products, tear pad coupons, and specially marked packaging. The latter turned out to be a gold mine of savings! Mini Wheats were on sale for $2.99 at Sobey’s (their flyer changes over on Thursdays). On it’s own this isn’t a crazy deal – they often go on sale for this price or even lower. I quickly put 6 boxes into my cart, though, because of …. I’ll have to stack these cereal boxes on their sides not that they’re missing part of the back panel after clipping the coupons. A small sacrifice to make for the overall savings on our grocery bill. All of the coupons are good through April 15, 2014 and there are no restrictions about using more than 1 coupon in a transaction (as long as you have one product per coupon). We buy at least 1 carton of strawberries per week and I’m almost positive that we’ll score some FREE Almond Breeze with these $1 OFF coupons combined with a cash back rebate through Checkout51 or SnapSaves. I’m hoping to combine the $1 OFF almond coupons with the $3 OFF when you spend $10 at the Bulk Barn coupons that we get in the weekly flyer – I’ll keep you posted if it works! I clipped the coupons from the boxes and walked over to our local Walmart the next day. Lo and behold, they had the specially marked boxes as well, but regular priced at $4. No worries! Walmart price-matches any competitor’s flyer. I redeemed 6x$2 Mini Wheats and 2x$1 strawberries coupons and recouped $14 from my original $18 purchase! Add coupons to price-matched sale prices for 2 layers of savings. By redeeming my coupons on more specially marked boxes, I now have another 6 sets of coupons! With any luck, by the time we’re ready to buy more Mini Wheats in the spring, I’ll be able to redeem them for a fresh batch of specially marked boxes with a new offer! These savings trains can go on for many months and help make a dent in our grocery bill – part of my Save-at-Home-Mom savings strategy. We see specially marked package coupons in almost every department at the grocery store and if you have the time to buy the products one at a time and only pay full price for the first product in your savings train, you can save even more money. This week’s discovery while window shopping at Sobey’s reminded me that no matter how slick our savings system becomes with the flyer apps, online coupons, and cash back rebates, there’s still a place in the world for those who like to stroll the aisles and keep a good pair of scissors in their purse!